We have seen evidence of the work of well-known architect Andrea Stombuco in these pages before. Today we will examine a builder who converted many of Stombuco's dreams into reality. He was an Irish immigrant named John Arthur Manus O'Keeffe. O'Keeffe came to Australia in 1857 and initially settled in Toowoomba where he worked as a builder, possibly on the railways. Next we find him, a decade later, mining the gold fields of Gympie. This activity allowed O'Keeffe to amass a sizeable land holding, mainly heavily wooded, from where he would be able to source timber for the construction work he was about to undertake. 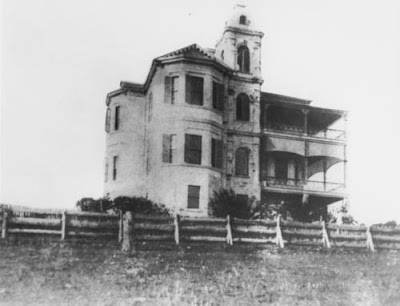 By the end of the 1870s O'Keeffe had moved with his wife and family to Spring Hill in Brisbane in order to embark on the career for which he is best remembered. 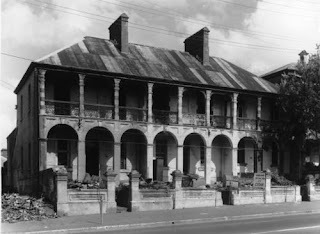 In the Brisbane boom-times of the 1880s his company would construct many of Brisbane's most notable buildings. The firm of Messrs O'Keeffe & Co operated mainly in the private sector, eschewing the government construction work that was also plentiful at this time. 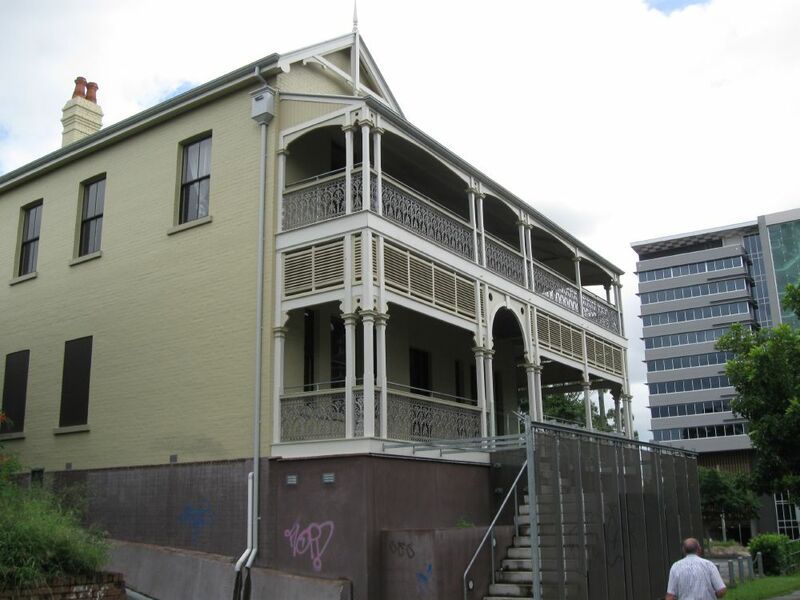 Among his non-Stombuco accomplishments were the fabulous Dura at Hendra, designed by HGO Thomas, built by O'Keeffe in 1888-89 and known now as Glengariff; as well as Collins Place built in 1889-90 at South Brisbane for hotelier Michael Foley (pictured below, Glengariff top & Collins Place bottom). 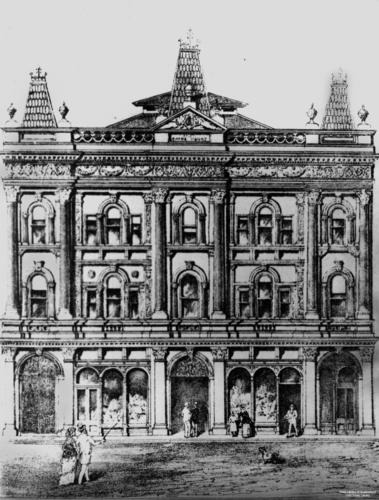 Around this time he created Stombuco's impressive Her Majesty's Opera House in Queen St, shown in the drawing below. 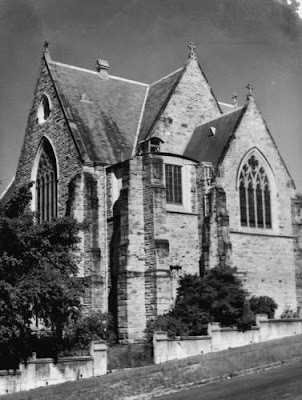 Regrettably this ornate building was demolished during the Joh Bjelke-Petersen era of destruction. 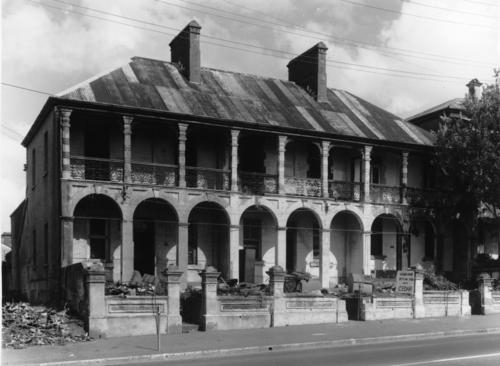 Also of note were the terrace houses situated on Petrie Terrace that came to be home for the O'Keeffe family and now are a Brisbane landmark close to the Normanby Fiveways. They are pictured here in 1977, prior to a restoration. Stombuco was also an accomplished ecclesiastical architect who had already designed several churches in Victoria, and in Brisbane he designed these churches that were built by O'Keeffe - firstly St Patrick's Catholic Church at Fortitude Valley. 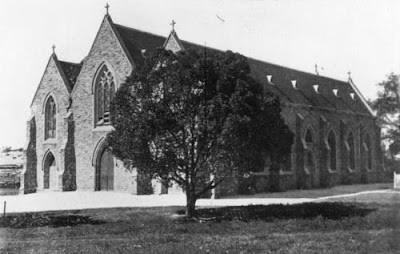 And also St Andrew's Anglican Church at South Brisbane. Then there was the building meant to be Stombuco's own residence (Sans Souci, now Palma Rosa) where O'Keeffe was the principal contractor, the others being Andrew Petrie (stonework) and John Watson (plumbing). Unfortunately for Stombuco he wasn't able to reside there - at least not for long, as the building boom in Brisbane was soon to end. The boom era of the 1880s preceded the bust of the 1890s. A financial melt-down together with the natural disasters of the huge floods of 1890 and 1893 caused many businesses to fail. Stambuco left Brisbane for Perth in 1891, never to return. O'Keeffe's business was forced into liquidation but he managed to repay most of his debts before his death in 1913 at the age of 76. Note: Historian Rod Fisher completed what he has called his "farewell to Brisbane arms" in 2011 prior to moving to Brazil - a thoroughly researched opus called "The Best of Colonial Brisbane", and the information presented here is drawn mainly from that source. Why would you bulldoze a building like that Opera House? It's crazy! Yep, there are no words to describe it other than vandalism.